You can now print or fill out official forms from your home computer. Here are the steps you need to save and return it to the City of Ballinger. 1. Click on a link to open the desired Form. 2. Save the form to your computer. a. Complete the form on your computer, save it, and print it out. b. Print out the form and complete it. 4. Return the form to City Hall. An application fee will be charged at this point if applicable. 5. The permit will be reviewed and a city official will contact you with approval or denial. 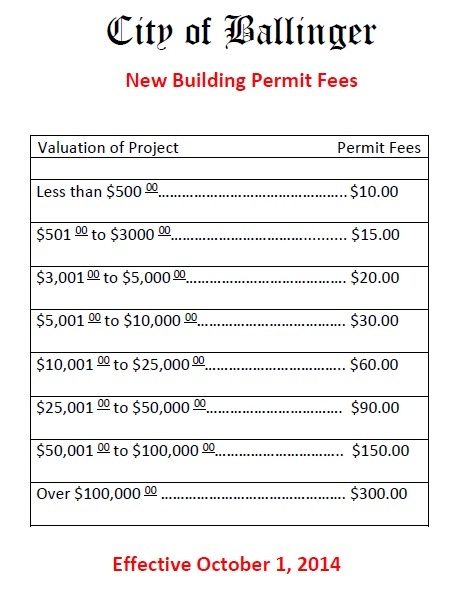 To find out more information and regulations on building, refer to the City of Ballinger Code Book, or contact City Hall.